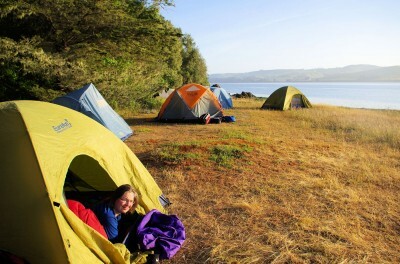 Tomales Bay Camping Permits are EXTREMELY LIMITED, and sell out as early as 6 months in advance. 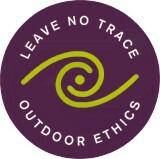 Accordingly, we have developed a group camping program which groups of 10 or less are invited to join. (Private camps can be set up for larger groups on any day by calling in) We set up a waterside camp that is reached by a 2-3 mile scenic paddle, equipped with tables, camp chairs, camp stove, firewood for one fire, fresh water, and staffed by our capable and friendly kayak guides. All that you need to bring is your food for the trip, tent, sleeping bag/ pad, and anything else you would like to have on your adventure. Arrive at 10am, load your gear on to our motorboat, and then enjoy the beautiful paddle to your campsite with your knowledgeable guides. On all our group camps, your guide and camp host will lead guided tours from camp for anyone who wants to explore Tomales Bay after the sun goes down. On dark nights we’ll explore the shoreline and be thrilled by the natural light show in the water that is bioluminescence, and on moonlit nights we’ll paddle in the glow of glorious moonlight and stars. (There is still a slight chance to see bioluminescence on these moonlit nights if the fog comes in) Both are wonderful and exciting experiences! In both cases, your night will end with you sleeping peacefully at the waters edge. *There will camps on two consecutive nights for Memorial Day and 4th of July weekends: Saturday and Sunday. You can arrange to stay for one or both nights. 12:30-2PM -Enjoy a beautiful paddle over to your campsite with our fun and knowledgeable guides. 2pm-Dark – Once we arrive at our beach we will set up our base camp & kitchen, which will be available to use at your leasure throughout the trip. Ater lunch you will have free time to enjoy the beach and the Point Reyes National Seashore. Explore the coastline by kayak, take a hike up the ridge, read a book, take a nap, swim….there are so many options. After Dark (time will change depending on the time of year) – Night Paddle from the beach. 9AM – Our motor boat will arrive at the beach to load our camping gear to be brought back to Miller Boat Launch.